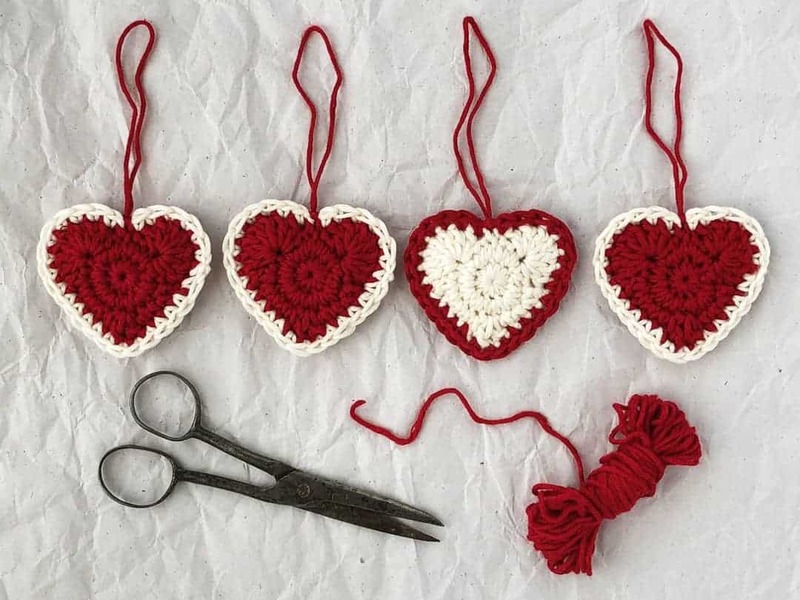 Fun to make, these adorable DIY country style crochet Christmas heart ornaments will make an impressive tree decoration or original handmade present for friends and family. 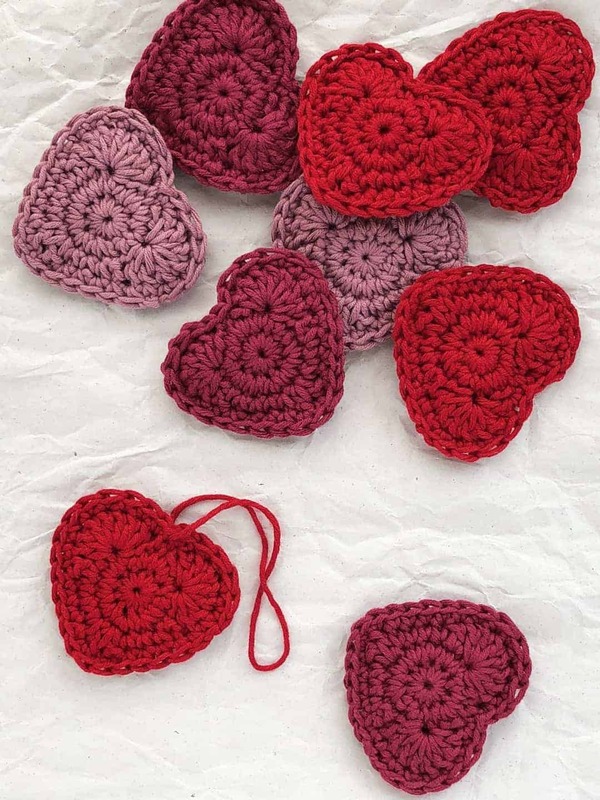 It’s one month to Christmas and every evening I’ve been busy crocheting these cute heart ornaments. I will need a lot of them as I am planning to decorate our Christmas tree with them and give a few as handmade presents to my close friends and family. My boys even asked if they can give some to their friends at school so I’m busy making enough for everyone. The ornaments are inspired by Scandinavian Christmas decorations. I think using red and ivory colours make them look more traditional. I am sure they will look great on our Christmas tree next to some gingerbread men biscuits. 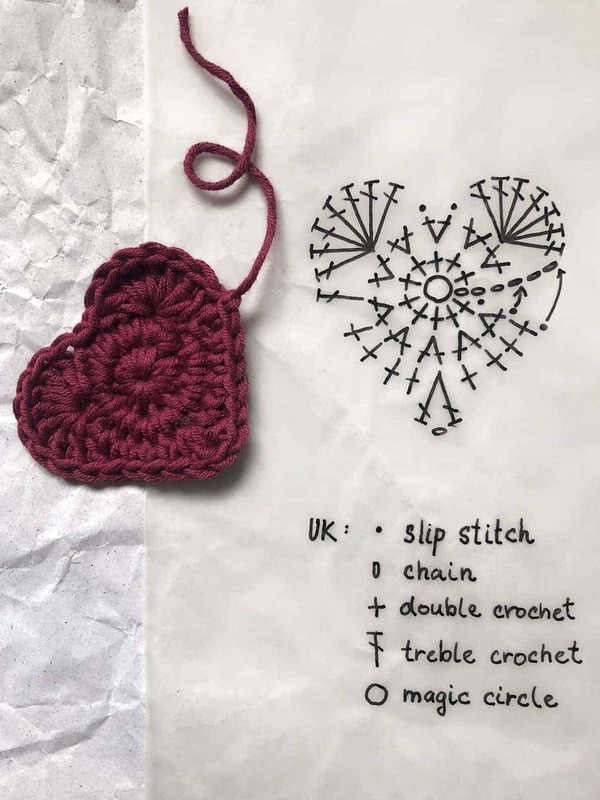 My crochet hearts are made of King Cole Bamboo Cotton yarn with a 3 mm size hook and a combination of double crochet and treble stitches. 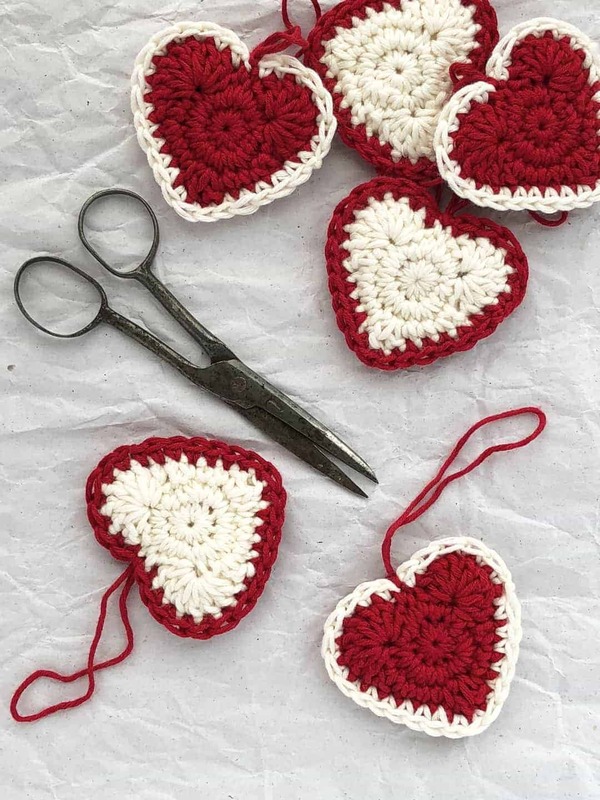 Each decoration is made of two heart shapes joined together with a double crochet stitch. Before closing the heart I tuck all the remaining offcuts of yarn inside the pocket. The final step is to attach an eyelet to each heart so it can be hung as a decoration. The pattern is completely my own invention. I very rarely follow instructions when doing crochet. The pattern is completely my own invention. I very rarely follow instructions when doing crochet. I just look for inspiration and then I experiment with different stitches to create the desired shape. I’ve never tried to make a pattern of my experiments before, so this is my first attempt. 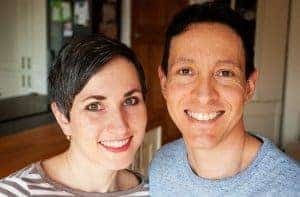 I hope you let me know in comments below how easy it is to follow the instruction. Now when I have my Christmas tree ornaments ready, I’m working to make plenty of hearts that I want to give as presents. After a while, it becomes very repetitive work to do. But with a cup of warm tea and a good TV program in the background, it is pretty calming and relaxing. I’m happy and excited because we are one step closer to Christmas every time I finish another heart. What a great way to fill the house with the scent of sweet baking and make the most delicate Linzer cookies. There is certainly love in the air!